The Irish Rose - a Colorado Dream Vacation Spot - Secluded! 'The Irish Rose' - Your Colorado dream vacation get-away! The Irish Rose has become a vacation favorite for guests from all over the world! Just take a look at our guestbook comments below! This mountain cabin is located on the historic Mosquito Gulch Trail. Just 15 miles south of Breckenridge, it is the perfect spot for either a secluded get-away or a ski vacation at a fraction of the cost. Centered on ten acres of pine and aspen, the Irish Rose was designed to accommodate those who want a true Colorado experience. With Mosquito Creek flowing nearby, you will enjoy spectacular views of Pennsylvania and London Mountains as you relax with family and friends. A seven person hot tub sits out front in the location of an old historic mine if you want to relax and enjoy the view from there! If summer hiking, biking or four-wheeling is your desire, four of Colorado's 14,000 foot peaks are at your doorstep, providing some of the best hiking and driving trails in the world. Tackle the summits of Mount Bross, Mount Democrat, Mount Cameron, and Mount Lincoln... all in a single day! Gold pan on the local creeks, explore 'Buckskin Joe' trail, and visit the ghost town of Park City. The historic mining towns of Alma and Fairplay are also nearby. Mountain bike to your heart's content or drive the legendary 4x4 'Mosquito Pass' into Leadville. Pick wildlowers and view wildlife--there's something for everyone! If winter activities are your goal, the beautiful village of Breckenridge is just a short drive north where you can enjoy premier Colorado skiing, dining, and shopping. Keystone, Arapahoe Basin, and Copper Mountain are also close. Or, stay near home and cross-country ski to your heart's content. We have it all! The Irish Rose was built with families in mind. The main level has a great room with a gas fireplace and floor-to-ceiling windows showcasing the beautiful mountains and trees. It is surrounded by a huge 32x8 foot wrap-around deck. A full kitchen and dining area are also on this level to create an open, spacious environment. Pets are NOT allowed, No Smoking. There are two main level bedrooms, one with a queen bed, and one with double bed and trundle geared for up to three kids. The great room sofa also pulls out to a queen-size bed. The master bedroom loft has a queen bed, washer and dryer, along with a small private balcony. There are full baths on both the main level and the loft. The cabin also has a lower level with a private entrance in the back which is occupied by 'Mountain Kay', the landlord. Kay has 30+ years of experience in Park and Summit Counties. She is quiet, very knowledgeable on the local area, and can assist with anything you need. She has two old dogs who will go hiking with you if you like! Experience the Rocky Mountains in the comfort of the 'Irish Rose'. At over 10,000ft elevation, it's as close to heaven as you can get! Just a military family that has long ties to Colorado and loves the mountains! We are very blessed to have a property we can share with others. Pure Colorado. The property feels secluded but still close to civilization! Summer is our busiest season! Hiking, mountain biking, exploring, gold panning, fishing, four-wheeling, etc make it an awesome summer getaway! Great base also for skiing and winter activities. You won't be disapointed! toilet, tub, shower, View of the river. Amazing Views of Penn and London Mountains, Mosquito Peak and Mt Silverheels. No long distance calls. Purchase a calling card if required. Cell service is unreliable. Code for WiFi access provided. Dining table seats six and kitchen bar has three bar stools. High chair attaches to adult chair. We really enjoyed the spaciousness and the quiet location. The view is wonderful! The heat was a nice cozy warm (as it snowed outside) and we enjoyed the simple propane fire/stove. The kitchen was well stocked & there were tons of movies & games. We will definitely be back in the future. We LOVED the Irish Rose! Alma was hit with several epic snowstorms the week before, so there was about 2 or 3 feet of snow on the ground. So beautiful! The cabin was cozy and packed with all necessities except food. They even had spices, foil, coffee, sleds, hundreds of movies, etc. Kay was a wealth of info for places to eat, and left delicious goodies. She was gone all week also. Saw beautiful birds and squirrels at the cabin. But I think the snow was too deep for the big animals to venture out. We didn't get to walk around the yard or enjoy the creek due to the deep snow. The hot tub and views were amazing! We drove to Buena Vista with our two teenage boys, fished the Arkansas River and venture around daily. Took a cooler for lunch every day. Snowmobiles in Breckenridge .....awesome!!! The sun shined bright daily. We had to wear sunscreen. We also needed to use our canned oxygen on occasion due to altitude. We adjusted after 1 or 2 days. For anyone looking for the perfect cozy cabin with seclusion, wifi, and mtn views, this is it!! My in-laws from out of state and my two young sons joined my wife and I for 3 days at the Irish Rose in late March. It is secluded and a great spot to take in the winter beauty. There was a large snowstorm the week before, but the road was cleared enough for our 2-wheel sedan to drive to the cabin. We got about 4 inches of snow on the day we left and we were able to make it out fine! One day, we drove over Hoosier Pass to the Breckenridge sledding hill at Carter park (free!) and that took just a half hour. Make sure you drink a lot of water, though, as the cabin is about twice as high as Denver. Otherwise, the cabin is well stocked with DVDs and games and the scenery is gorgeous to take in from the hot tub. Great cabin and well kept up! Thanks! This cabin is amazing. Everything you need to break away from the hustle and bustle of life! Games, movies you name it and they have it. We enjoyed the views of the mountain and the time with family. Kay was a delight as well. 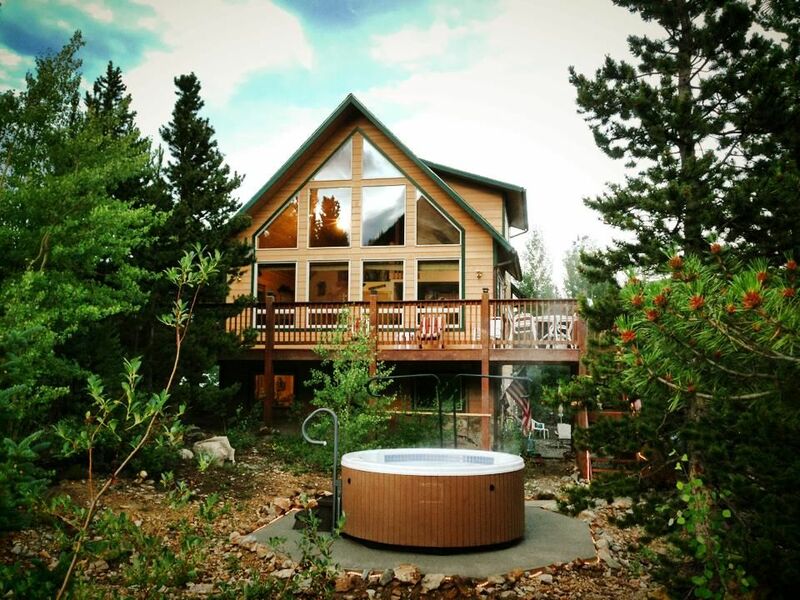 We would recommend this cabin for your next stay in Colorado! Property was beautiful as expected! We had a great time at the cabin and skiing in Breckenridge! Great place to unwind after a long day at the slopes. The location is beautiful and the complementary banana bread and gift bag were a wonderful bonus! We'll gladly stay here again the next time we visit the area! If you stay in the winter period, don't forget to use the provided humidifiers! We didn't think we needed them the first night but we learned from that mistake haha. Cleaning fee $120 for groups of seven or more. Additional charge of $25 per adult per night for every adult over six in the group (children not included). 10% discount for military active/reserve or retired.